BR038. 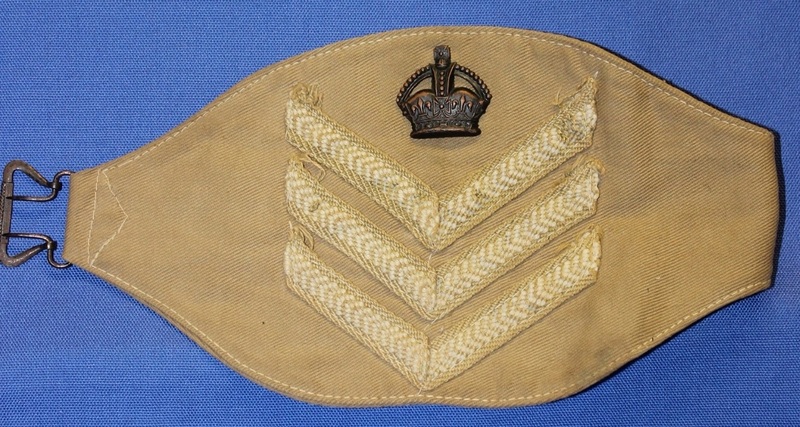 A WW2 khaki cotton drill brassard with sergeant rank and a metal crown above, it is closed with a metal buckle. BR039. 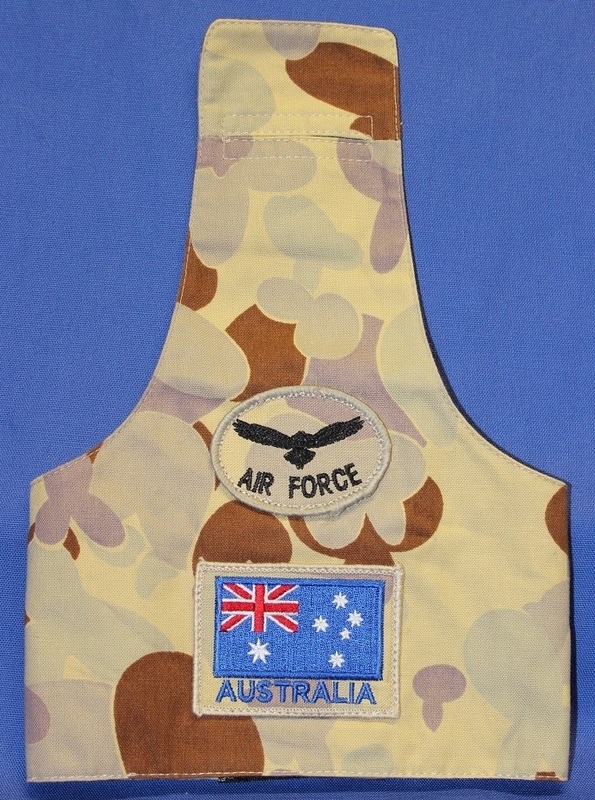 A DPDU cotton brassard with the Australian flag applied with a RAAF biscuit above, it has a slot for the epaulet and is closed with Velcro. BR040. 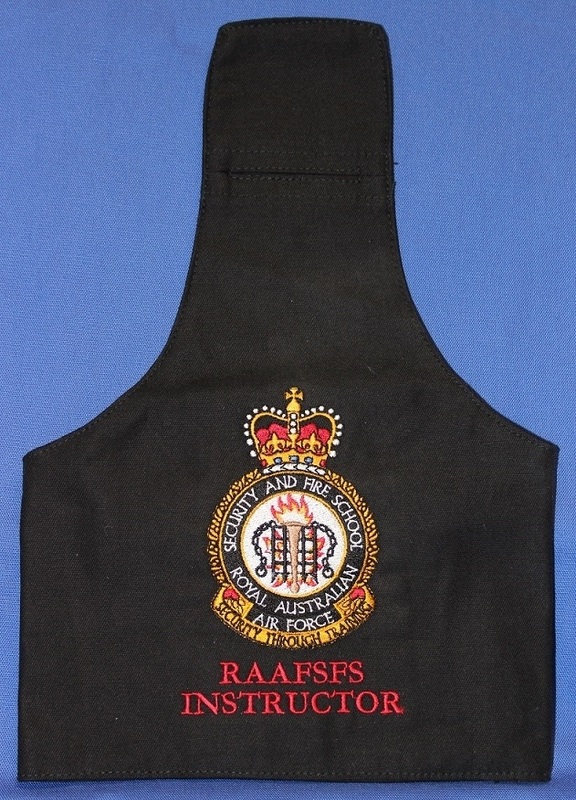 A black cotton brassard with an embroidered badge of the RAAF Security and Fire School and RAAFSFS INSTRUCTOR in red. It has a slot for the epaulet and is closed with Velcro. BR041. 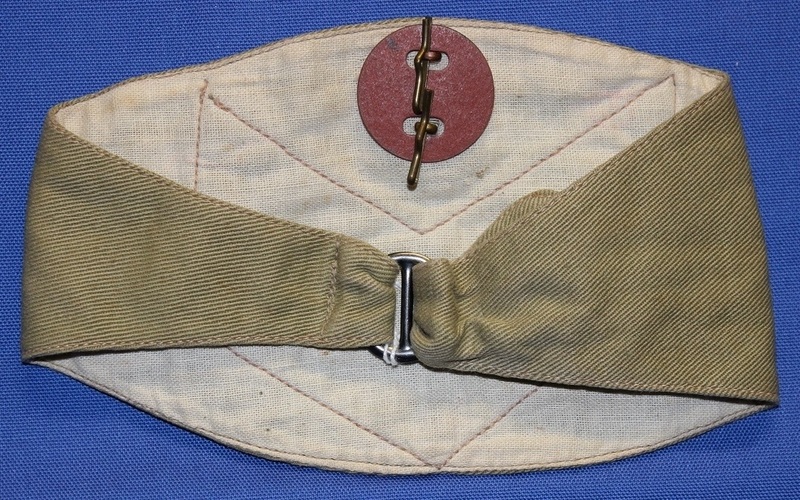 A DPCU cotton brassard lined with khaki material with a 114 Control and Reporting Unit patch affixed to a flap held by Velcro with a pen holder pocket underneath. It has a tape loop for the epaulet and is closed with Velcro. BR042. 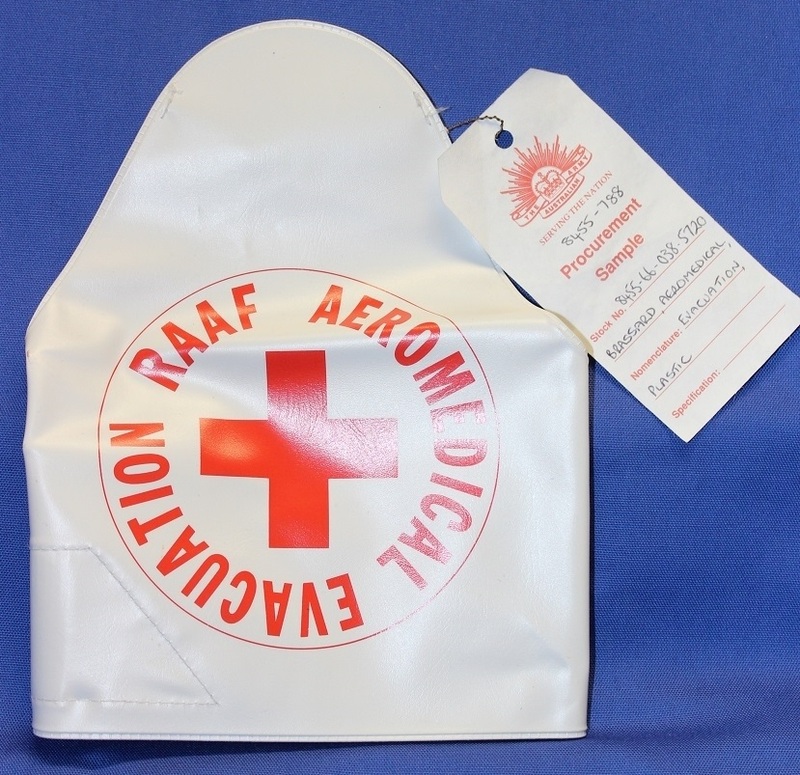 A white vinyl brassard printed with a red cross surrounded by RAAF AEROMEDICAL EVACUATION in red. It has a tape loop for the epaulet and is closed with Velcro. Sealed sample. BR043. 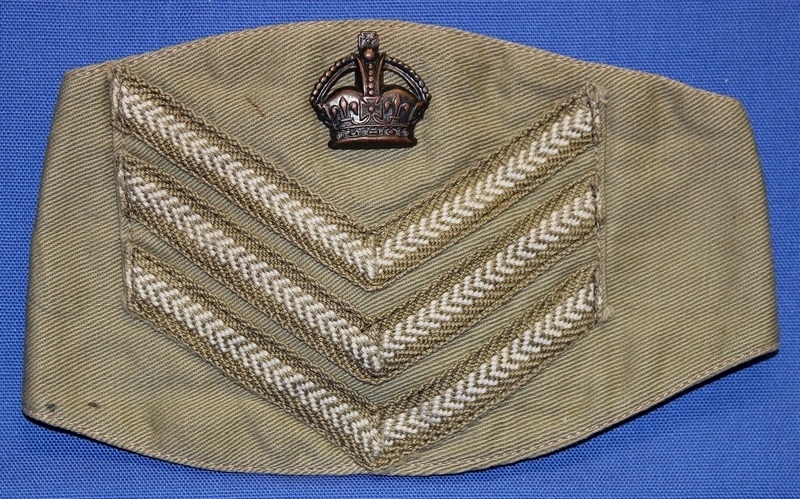 A jungle green cotton drill brassard with sergeant chevrons and an oxidised crown. BR043. 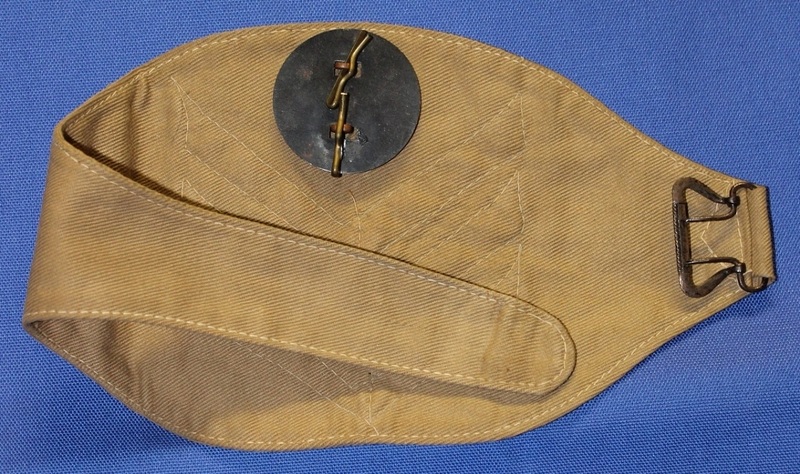 Back view of brassard showing buckle closure and fibre backing plate. BR044. 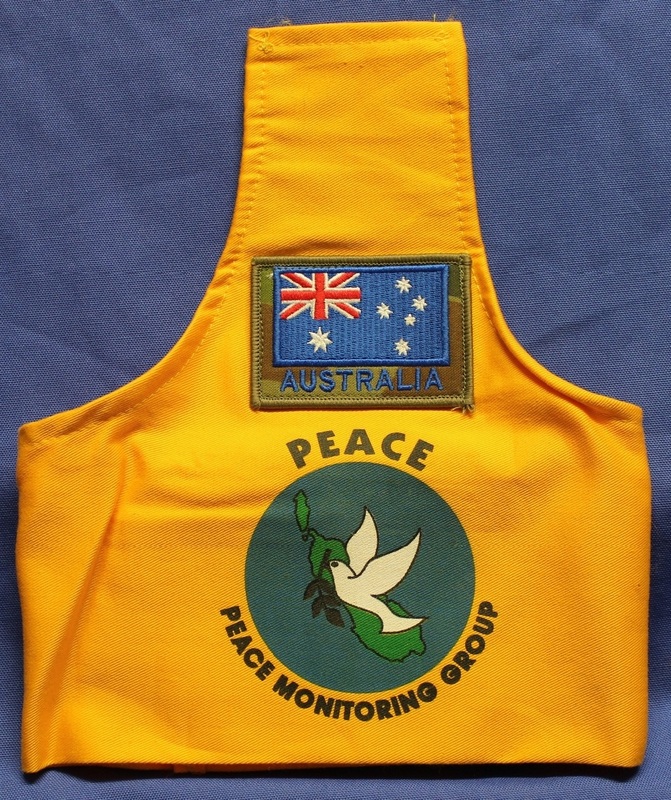 A yellow cotton brassard with the United Nation symbol screen printed on it and the Australian flag sewn above, it has a slot for the epaulet and closed with Velcro. 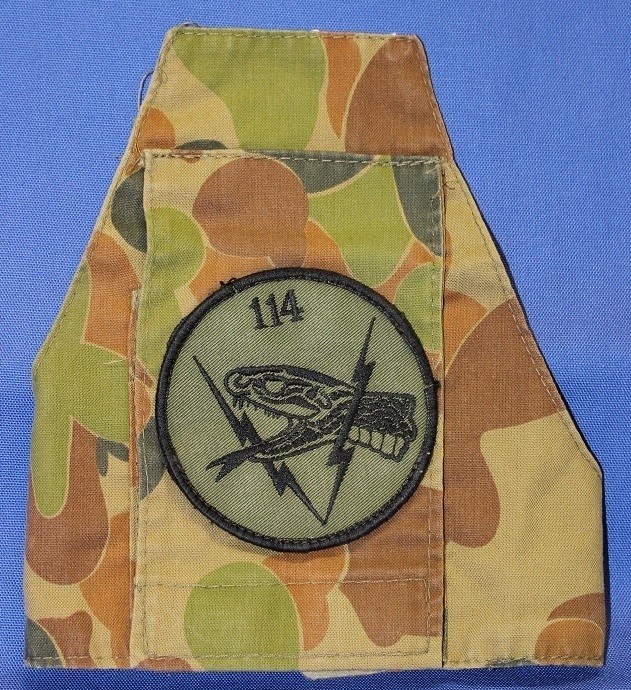 This brassard was worn by Squadron Leader Peter Liddy in Timor. BR044. Rank, name and number on back of brassard. BR045. 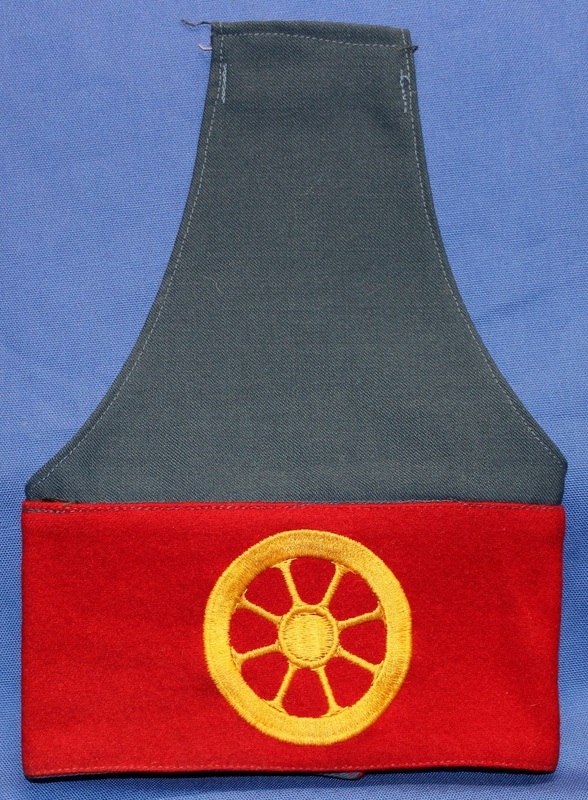 A red wool felt brassard lined with blue cotton embroidered with gold wheel, representing the Movement Control Office (MCO). The lining is extended to include the epaulet and is closed with Velcro. BR046. 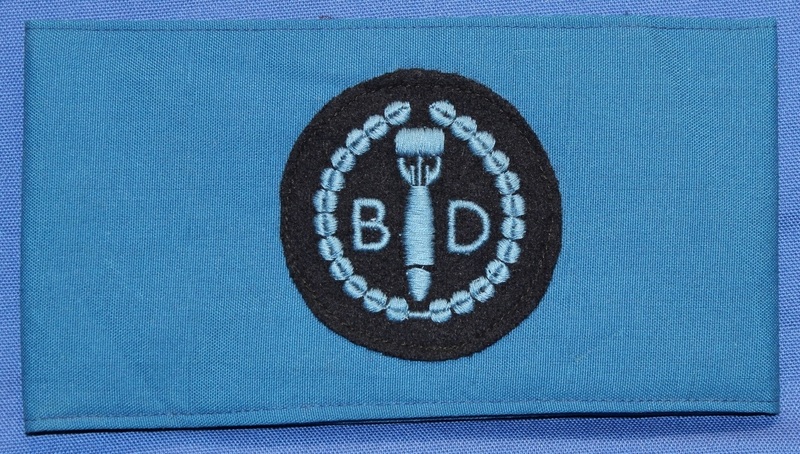 A light blue cotton brassard with an embroidered felt Bomb Disposal patch applied, brassard is closed by Velcro. BR047. 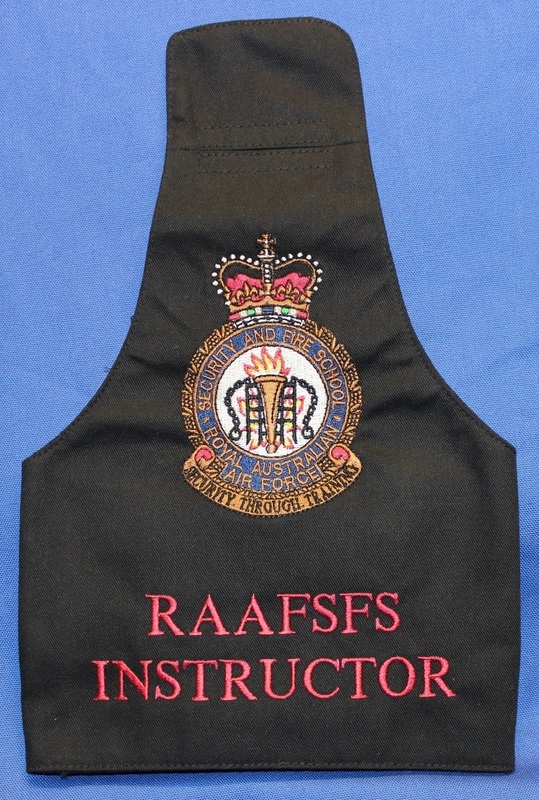 A black cotton brassard with an embroidered badge of the RAAF Security and Fire School and RAAFSFS INSTRUCTOR in red. It has a slot for the epaulet and is closed with Velcro. BR048. 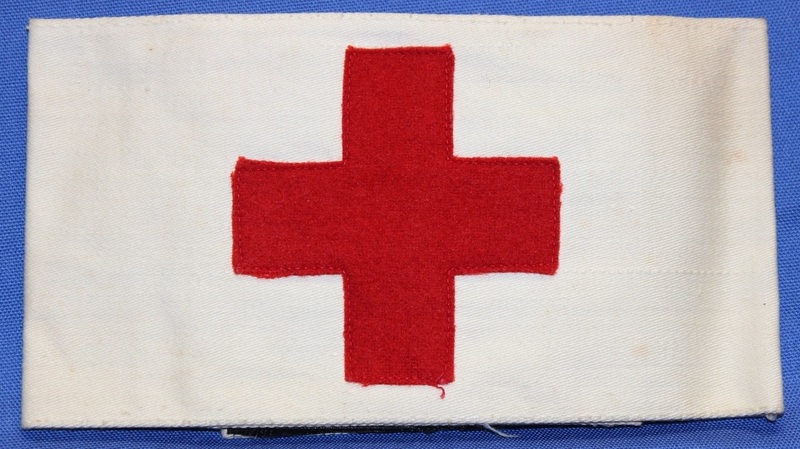 A white cotton drill armband with a red felt cross sewn on top, armband is closed by Velcro.